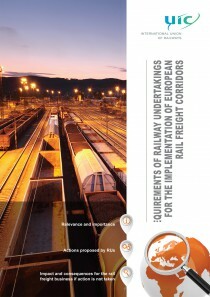 Regulation (EU) No 913/2010 of 22 September 2010 describes the process for the establishment of international rail freight corridors (RFC) with a view to the development of a competitive European rail freight network. Progress has been made towards the implementation of the RFCs, with the establishment of some RFCs and related board and advisory groups, completion of Transport Market Studies and drafting of Investment and Implementation Plans by IMs, development of harmonised processes and computer systems for path allocation and exchange of trafficinformation, and the creation of RFC websites. Important progress has therefore already been made, and some RFC services were launched on 10 November 2013. In order to further the progress made, the following Railway Undertakings (RU), DBSR, BLS, Trenitalia, SNCF, CFLMM, Captrain, RCA, RC Hungaria, B Logistics, SBB, CP, PKP, in cooperation with the International Union of Railways (UIC), have prepared a list of priority topics which need to be progressed. These are analysed in terms of their importance for developing rail freight trafficand implementation proposals are identifiedfor each. A summary spreadsheet of these topics and timescale for implementation is appended.